Cottage cheese with gram flour batter & deep fried. Chicken fillet marinated with garlic and ginger, lime, turmeric and paprika, roasted. Seasoned minced beef with eggs and fried spices. Samosas, onions bhajia, mix pakoras, seekh kebab, murgh malai. Seasoned vegetables wrapped in flour dough and fried crispy golden. Tender pieces of chicken grilled and sautéed laboriously in butter and fresh herbs. Chicken breast in a spicy sauce red and green chillies, aromatic ground spices, blended with onions, peppers and coriander seeds. ants grilled and cooked with onions in creamy sauce. Situé au coeur de Genève, à proximité de la gare et à 100 mètres du Lac Léman, le restaurant Shahi fait honneur à la tradition de la Fine Cuisine Indienne en s'inspirant des saveurs régionales présentes en Inde. Le restaurant peut accueillir jusqu'à 60 convives pour déjeuner et dîner et la salle peut-être privatisée côté bar. Le restaurant a ouvert ses portes en 1995. La philosophie des lieux est de proposer une expérience culinaire inoubliable au travers de la découverte des saveurs de la plus pure Cuisine Indienne. Des mets raffinés, frais et authentiques sont notre signature. The food and service were good, but the portions are quite small, maybe because of The Fork discount? It was our first time in Shahi and what a delicious dinner we had! The service was extremely nice and also available. 100% recommended. We will repeat for sure. This was our second visit to Shahi and once again we were not disappointed. The format of the dishes seems to have changed but certainly not the quality. In particular I enjoyed the slow-cooked lamb biryani specialty with its delicious and creamy sauce, Friendly staff, quiet atmosphere and a welcome 50% discount through La Fourchette. Great tasting food, we found it very authentic. We’ll definitely come back! Best chicken tikka masala in town! Absolutely delicious food, can recommend it without hesitation! Overpriced for a typical Indian restaurant in India. Taste was fine. Very nice restaurant. Good atmosphere. Great little place, tasty food and great service ! The food was good, but without the discount, the price would have been too much, and not competitive to other Indian restaurants in the area of the same quality. For the price, the dish size was relatively small. 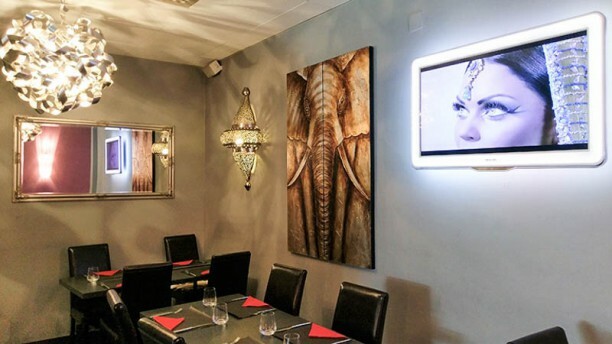 The decor was interesting, as the restaurant attempts to maintain its connection to both India and Italy, resulting in a constant screen slideshow that features pictures of the Taj Mahal, followed by an image of Pavarotti. On a side note, I have eaten here once before for their lunch menu of a 20chf thali which was better value and was also very tasty. Unfortunately not the best restaurant experience we have had. The food was luke warm and i think we were given yesterdays meat. The portions are tiny given the price. 6 morcels of spiced meat for 40frs. The owner was nice. With the 50% offer its ok but still i wouldnt go back. The food was really good and to top this the service was amazing, they were very friendly. We had a great time. The dishes were quite small in quantity, but it was delicious, served in a very good athmosphere. Authentic Indian food in a beatufil surrounding. Rogan josh was one of the best we’ve had anywhere in the world.